One of my personal dislikes of the basic AR15 platform is the fact that they do not have folding stocks. I am not talking about rifles like the Sig 556 or other variants, I’m talking about true AR15s. The issue, of course, is the need for the buffer system located in the stock. Without the buffer system engaged, the life of your AR15 wouldn’t last past the next shot probably. 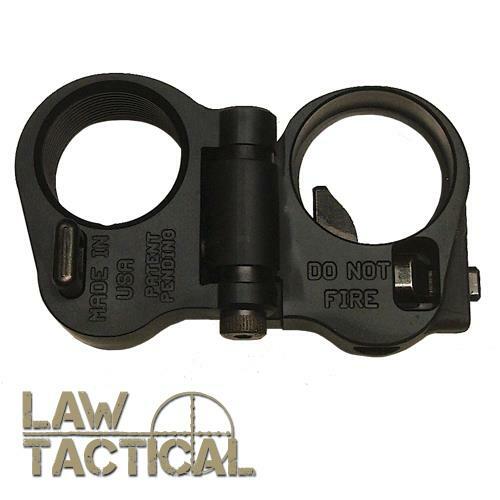 So I did some searching around the web and came across a folding stock adapter for AR15s made by Law Tactical. According to the company, it’s “The only folding stock adapter compatible with AR platform rifles.” I was curious enough to go ahead and buy one and see if it was worth the money. After reading the instructions and studying the adapter for a couple of minutes, the mechanics began to make sense. The key element to the adapter is the bolt extension that engages with your buffer when the stock is in the unfolded position. When the stock is folded, the adapter is held in by a fastener. Likewise, the buffer is held in by the traditional buffer retaining pin. With this in mind, it is important to note that the rifler CANNOT be fired when the stock is in the folded position. With the buffer system disengaged, it is not capable of functioning properly and may cause serious damage to your rifle or yourself. So why would a person want to install a folding adapter on a rifle if it cannot be fired in the folded position? The simple answer…portability. I have found that with the stock folded, you save enough length on your rifle that you could possibly transport it in a decent size rucksack or tactical bag (depending on the overall size of your rifle). Some may argue that if you cannot fire it folded, it is useless, I disagree. Any amount of length I can shave off my rifle for ease of portability is a positive in my book. Overall, I highly recommend this product to any AR owner. It’s fairly easy to install, minus the castle nut which is recessed and a little difficult to tighten (I found using needle nose pliers can solve this, email me if you want to know more). In the future, I plan to sell these on the website www.defensefirearms.com but would value other people’s opinions before I do. Please feel free to give me your opinions on an adapter like this, I’m sure others will want to hear them as well. Looks great! how can I buy one?